The 14-inch Dell Latitude 6430u is Dell’s ﬁrst business Ultrabook, but it’s signiﬁcantly heavier and thicker than other business notebooks. The reason is simple: Dell squeezes a larger-than-average battery (60Wh) into the 6430u. 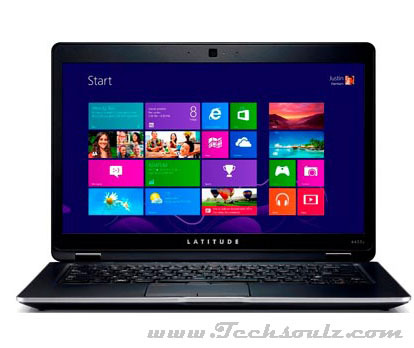 This of course improves the machine’s battery life – important for a business Ultrabook – by a signiﬁcant amount. Of all the newer business notebooks we’ve tested this year, the 6430u managed to outperform all of them by at least a full 30 minutes in the Powermark benchmark. Our recorded run-time of nearly four and half hours is enough to get you through at least half a workday of intensive use while you’re away from a power socket. This also means that under a less intensive load of emails and spreadsheets, it wouldn’t be too far-fetched to say it could last you a full workday. Users can swap out the battery for one that’s half the size and weight, though the obvious downside is that battery capacity is reduced by almost half as well. We do like the 6430u’s design and build quality. It’s still mostly made of plastic like older generation Latitudes, but now a lot less prone to ﬂex and creaks. Dell also throws in an aluminum frame that reinforces the rigidity of the whole machine, which was a clever touch. The 6430u does come with a soft-touch coat of paint on both the lid and palm rest, which does lend a nice premium feel to the whole package. We also really like the backlit keyboard on the 6430u. It had very deep key travel, and a very rigid return. This makes the keyboard much more comfortable to type on, almost like a shallow mechanical keyboard. The 6430u has a good number of ports which include the essential VGA and RJ45 ports – not found on many thinner Ultrabooks in the market – on top of the trio of USB ports (2x USB 3.0 and 1x USB 2.0). Due to the 6430u’s rather generic Ultrabook components (Intel Core i5 processor, 4GB of RAM, Intel HD 4000 graphics and 128GB SSD), it doesn’t have much of an advantage over other Ultrabooks with its PC Mark score of 5,035 PCMarks. Another disappointment was the use of a 1366 x 768 pixel resolution display on the 6430u. If devices like Dell’s own XPS 12 (or XPS 13) can sport 1600 x 900 pixel resolution displays, we see no reason why business machines like the 6430u can’t beneﬁt from the same. After all, more screen real-estate means more room for additional spreadsheet columns. Then there’s the rather small touchpad on the 6430u to contend with. Most other modern Ultrabooks have big, clickable touchpads which are so much more comfortable to use, so it’s also a waste that the 6430u doesn’t have one as well. Bugbears aside though, the 6430u is also probably one of the better business-oriented Ultrabooks we’ve come across. It’s well built, its got reasonably good performance, and most of all, impressive battery life. Best of all, the asking price of $2,194 is also lower than many competing business Ultrabooks on sale today.